Adventures in the Endless Pursuit of Entertainment: Fanny at Encores! Karigee, Roxie, Kevin and I saw the last Fanny at Encores on Sunday night. It was so good! 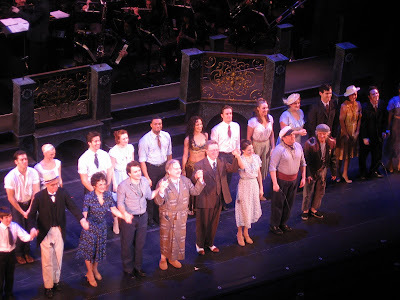 It's so nice to see a nice, fairly realistic adult musical with really pretty music about regular people who love each other and treat each other with humanity and respect, starring some older than usual people. I loved seeing George Hearn on stage again (I know, I know, that's no surprise) and Fred Applegate was just wonderful! Kevin wrote a thesis about the work - so go read it.